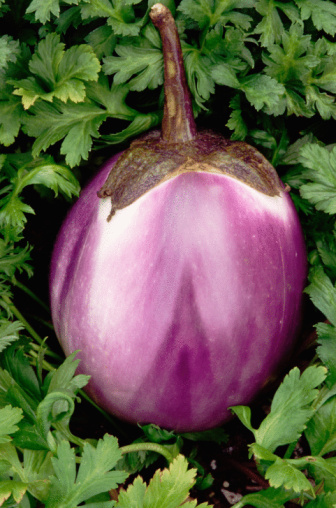 Eggplants are garden cousins of tomato and pepper plants. When you grow eggplants in a backyard garden, expect them to grow in similar fashion to tomato plants. Gardeners often stake eggplant plants to give them sufficient support as they grow taller and larger throughout the growing season. Prune eggplants carefully throughout the growing season to ensure that the plants grow properly and produce a bounty of delicious eggplants. Keep eggplants thriving with careful pruning. Watch the eggplant plants as they grow taller and larger. The stems of eggplants grow similarly to tomato plants, with suckers appearing between the main stalk and the side branches. If you do not prune away these suckers, they will divert plant energy and you may have fewer and smaller eggplants. Position the pruning shears so the blades are flush with the main stem and clip off the suckers flush with the stem. Discard the suckers in the bucket as you remove them. Never leave discarded plant pieces littering the soil beneath a plant because this may introduce bacteria and infection to the plant. Clip off the oldest leaves from the bottom two or three branches to improve air circulation throughout the eggplant. Check the eggplants once each week to find suckers, removing the suckers you find. Trim the bottom leaves once each month.